Jeb Bush was in Iowa last week sticking his toe in the water to see if he really could win the general by losing the primary. I have to give him credit; he’s willing to stick to unpopular positions, even if they are politically toxic. He reiterated his support for Common Core, which is unpopular with some conservative activists, and opposed renewal fuel standards, which although they are not popular with Republicans in general, are popular in Iowa. So he’s not afraid to run against the grain. But I just can’t, in this or any other parallel universe, imagine Jeb Bush winning the Republican nomination. David Frum wrote a piece in The Atlantic last month describing Bush as a Republican version of Obama in that they have created artificial identities to hide behind. In Bush’s case, he is from a northeastern WASP family via Texas and now regards himself as an adopted Hispanic, speaking Spanish in the home, converting to Roman Catholicism, and moving to the Capital of Latin America, Miami. He may be the Republican Obama, but that’s not really his problem. Last name Bush. Dynasties don’t wear as well with Republicans as they do with Democrats. If Carolyn Kennedy threw her pill box shaped hat in the race, she would have a decent shot because…last name Kennedy. And this is even though she’s an incompetent who blew her chance to be appointed senator by being unable to talk in interviews. Hillary is the Democratic “front runner” now only because of dynasty. His family is messed up. His wife isn’t comfortable in English (probably because of the practice of speaking Spanish at home), She also has a shopping problem. All of his kids have been arrested at least once and his daughter was a drug addict. Not exactly a picture perfect first family. But the real clincher is that the only national issue Jeb is associated with is amnesty, which is unpopular with the base. Now of course whoever does end up with the nomination will probably be pro amnesty too since any anti-amnesty candidate won’t be able to get the funds to run. Republican donors are as pro amnesty as Chuck Schumer. But the other candidates will be associated with other issues. Jeb won’t. And on that issue he looks vacillating and contradictory. As I have written about previously, he came out with a book in 2013 about amnesty in which he proposed not offering a path to citizenship. Since he had always supported amnesty with citizenship before, on day 1 of his book tour he was asked why he changed his mind, and he stammered and it turned out he hadn’t changed his mind at all. So the first day of his book tour he disavowed the central premise of the book he was trying to sell. That will come up over and over in 2016. Of course, what Jeb was hoping for was that by the time 2016 rolled around, amnesty would have been a done deal, and he could have pointed to the book to say, “See? I was opposed to citizenship!” That would place him to the right of the actual policy. I think the odds look poor for that now. As a governor he wasn’t bad and was pretty tight with the State dollar, however he didn’t have any input in Federal areas like immigration. Frum’s article does make a good case for the similarities between Jeb and Obama, but I think the real take away is that when it comes to immigration, Jeb is certifiable. He seems to have no other passions other than illegal immigrants. And it’s not even a logical obsession. It’s actually more about preferring Latin Culture and people to the more Anglo variety that Jeb hails from. How else to explain the illogic of wanting to grant people who illegally cross the border amnesty (who are mostly Hispanic), but deport people who actually entered the country legally, but overstayed their visas (and who are primarily not Hispanic)? Never has an American politician been so blatant about replacing me and my family with someone else that he likes better. Bush is obviously carrying around some mental issues about his fellow Americans. The Democrats are far more circumspect than this. I hate to be one of those, “I’ll never vote for…” types who swear they’ll never vote if McCain/Romney/fill in the blank wins the nomination, but I think Jeb would actually be worse than any conceivable Democrat. 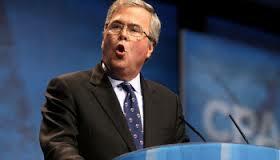 Except maybe Congressman Luis Gutiérrez, and even then, I’m not sure Gutiérrez is as obsessed with illegals as Jeb is. This afternoon the Senate passed its version of Immigration Reform, 68-32. 14 Republicans voted for the bill, including my Senator, Marco Rubio, severely damaging his chances for the Republican nomination in 2016. As frequent readers to this blog know, I strongly oppose the current Senate Immigration Bill and the concept of blanket amnesty in general. I’ve contacted my Congressman on this and am satisfied that we are of like minds on the issue. However my Senators are another story. Bill Nelson is Harry Reid’s lapdog so he does whatever he’s told. 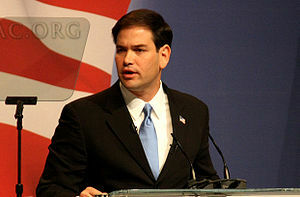 Marco Rubio on the other hand, is one of the architects of this immigration proposal. If there has been a bigger Tea Party disappointment in both the House and Senate, I can’t think who it would be. I tried calling the Senator’s office this week and got a voicemail to leave my comments after the beep. Unsurprisingly, the box was full. Apparently I’m not alone. So I wrote this letter and emailed it to the Senator. As your constituent, I have to say that you’ve profoundly disappointed me. But what really bothers me is that you’ve managed to fool me. I remember your debate with Charlie Crist in which you took the risky position (in Florida) that Social Security may have to be trimmed in order to save the program. You took a difficult and courageous political position while Crist looked like a weasel in comparison. “That’s a guy I can get behind.” I thought to myself. And I did. I voted for you and was proud to do it. I had heard you speak enough times that I felt sure of your Tea Party bonafides. You sir, were the real deal. Or at least that’s what I thought. I knew you had a special interest in immigration, but you had spoken out against amnesty enough in the campaign that I didn’t think that you were secretly harboring that as a legislative goal. I was sympathetic to your Dream Act proposal. Those kids didn’t commit crimes. They were brought into this country when they were too young to have any moral responsibility for what their parents did. Some sort of accommodation should be made for them. After the border was secure of course. But instead you rolled me. Me, and many others who had voted for you. After the experience of Obamacare, I wouldn’t have thought a Republican, let alone a Tea Party “darling” would support any bill that is billed as “comprehensive.” The purpose of comprehensive bills is to smuggle in what you really want by covering it with tons of other things. That’s certainly what your comprehensive immigration bill does. Every day I’m reading of new revelations of Easter eggs buried in your bill. You know them of course, since you helped put them there. I’m not opposed to cooperating with Democrats; that’s politics after all. I’m upset that you are not representing a Republican or conservative position in immigration reform. This wasn’t a compromise; this is a Democratic / liberal bill. You’ve merely provided cover for a liberal bill. I can’t tell where you begin and Chuck Schumer ends. Do you have any differences on this issue? Frankly, I can’t see that I’ve gotten anything different from you than if Charlie Crist had won the senatorial nomination. Oh one thing; Crist was honest about his support for amnesty. He didn’t lie about it like you did. You may argue that technically you weren’t lying, “go back and check the transcript!” But if you were parsing your words from the beginning, then what other conclusion can I draw but that you intended to deceive? Virtually everything you’ve promised has already been promised in the Simpson-Mazzoli bill. Since we didn’t get any of the border security promises then, why should I think we would get them now? That’s what you are importing. Your position doesn’t even make sense on its own merits. It goes without saying its bad politics. It’s a slow motion suicide of the Republican Party as a national contender, but I could forgive that if it was good policy. But it’s not. It’s bad policy too. It lowers the wage rates of the native working poor, it increases income inequality, it increases by millions the numbers of American poor, it inflicts long term financial stress on our entitlement programs, and creates a massive new underclass. Your bill is unfair. It grants sweeping immunity for crimes that would throw a citizen in jail. And no, I’m not talking about merely crossing the border illegally or overstaying a visa. Using, false identification and Social Security numbers aren’t minor misdemeanors, they are felonies. How can that possibly be justified? Since you seem committed to this dangerous course of action, you’ve left me and many others no choice but to support your primary opponent for your re-election, whoever that may be. And there will be a primary opponent. Don’t think that your former supporters will shrug and figure better you than a Republican who can’t will the general election or a Democrat. If your bill becomes law, in the long run there won’t be a real future for Republicans anyway. So if you are going to burn down the house, I want to at least make sure you don’t get re-elected to collect the insurance money. Of all the political issues I’ve researched, I’ve never understood how someone on the right could support blanket amnesty. If there is an intelligent argument to be made on its behalf, I’m still waiting to hear it. Instead, I hear insults to my intelligence like the kind your fellow gang member, Senator Graham offers. You really had a promising political future and I’m flummoxed at why you decided to throw it away in order to help Democratic political ambitions. If I get anything more than an automated response to this, I’ll be sure and post it, but won’t expect any sort of response. Rubio, even if ever read this, which is unlikely, won’t have an answer for it.